Hi everyone, welcome to my 'explosion' shape tutorial! The first time I used this design was in my 4th of July mani , representing fireworks. You loved it and requested a tutorial, so here it is :) The taping technique I use for it is similar to the zigzag pattern, so it's not very hard but it does require some patience because there are two taping sessions. So to make the time this design takes reasonable, I recommend using one-coaters or a fast drying topcoat. Let's get started! Start with the base color you like (if necessary with a basecoat underneath) and let it dry completely. To speed up the drying process you can apply a fast drying topcoat. The one I often use is Seche Vite, which enables me to place the tape strips on my nails after about 10 minutes. Now cut some triangles out of tape to make the 'explosion' shape. The way I do it is by first cutting a little piece off the tape roll which I then cut in half diagonally, like shown in the picture(s). I personally like to cut the strips while I let my base color dry. But I have to be careful then, otherwise the tape might get stuck to my nails and ruin the polish. So admittedly, it is safer to start with cutting before applying the base color. However, if you've learned how to cut the tape without having it touch your polished nails, it can save you a lot of time. 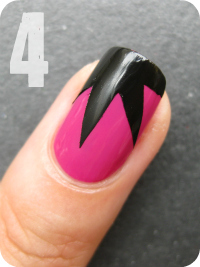 Now place the triangles one by one next to each other on the corner of your nail, in a slight curve. This will create the 'explosion' shape. It's your choice to make the shape at the cuticles or the tip, however my experience is that it's a lot easier near the tip, like shown in the picture. Because that way you're polishing away from the tape, reducing the chance of polish seeping underneath. Also you don't have to reckon with cuticles nearby. Make sure all the pieces of tape are fully adhered to the surface (they tend to lift up near the edges of the nail), if not use your finger or a tweezer to push them down or reattach them if needed. 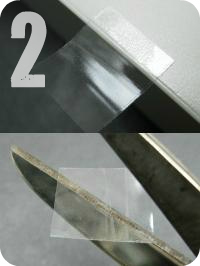 Then apply your first layering color with a thin coat and carefully peel off the pieces of tape right away. Try to peel them off individually, if you can, because most of the time your design will come out neater this way. Then let the design dry for a while. Use a fast drying topcoat to quicken the drying if needed. When the polish is entirely dry, you can start the taping process once again with your second layering color. Only this time place the triangles a bit more towards the tip, covering up a part of the first layering color like shown in the picture. 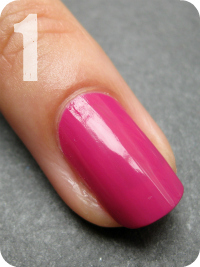 Apply your second layering polish and again remove the tape strips right away. At last apply your topcoat, clean up and you are done! Don't forget to moisturize your cuticles afterwards, because pulling tape off your skin so many times can really dry it out! Use this design for a full mani or cute accent nails. When you're going for a full mani, you can do the design on different spots on each nail for a playful look (example here). Polishes I used in this post are OPI Dim Sum Plum, Color Club Where's The Soiree? and China Glaze Millennium. Thanks for the tutorial!! I'm trying this right now!! THANKS FOR TUTORIAL. I MUST TRY IT. Great nails and great tutorial too, thanks for sharing. I love your use of colours for this mani. how long does this take you to finish the whole thing? This is a great tutorial! It doesn't look too difficult...at least that's what I'm saying before I try it. tnx for the tutorial :) it's beautiful! I love this! I'm going to have to try it soon! Great tutorial!! I have to try tape manis one day. Did you apply SV after your layering or what? this looks so amazing! i just put new polishes today so i guess i have to wait couple of days before i can try this one. Wow, this design is amazing, you're incrediably talented. How long was it before you got really good at using tape? Thanks for the tutorial, I'll definatly be trying it out! I absolutely love your designs! Need to try this one some time! Like always great tutorial! I cant wait to try this !! Can't wait to try this. Your manicures are always so much fun. Awesome tutorial! I haveee to try this! Awesome and very helpful tutorial Im so going to try this for pink wed I will come back and leave the link if I do again thanks so much! Thanks for the tutorial-for me,i'm not sure I have the patience and it looks like it takes a long time! It is really cool though! awesome tutorial! after I saw the design, I went ahead and tried it out on myself anyway in all different spots on the nail. I like how you tape the opposite way I do though.. I tape over the part I want to keep, then paint the rest a colour. interesting! thank you! it is SUPER useful!! Thanks! I'm going to try this look out. thanks for the tutorial! I never figured out how you got the two explosions exactly the same, I acually use the same tapestrips both times and still don´t get it the same :D It is ofcource just a differeence in what you like the most, nothing better than the other, but I really wanted to be able to do both. I think it is the way you cut your tape that make the difference, and a little also how you angle the first explosion :) I´m really loving tape manis so thank you for all the inspiration! Hele goeie tutorial! Dit wilde ik steeds al zeggen, maar het kwam er niet van! Ik denk dat ik het voor de eerste keer eens op 1 nagel uitprobeer. Het lijkt me al gaaf als dat lukt! Je tips zijn ook erg handig! Thank you so much everyone, you're the best!! @marox79: Yes, I used Seche Vite after I was done. But sometimes I’ll also grab my Sally Hansen Insta-Dry, which has a thinner substance but a slightly longer drying time. @Polish Vixen Marisa: I’m happy to hear that ^^ Thank you! @Cristina - PeeBeforePolish: That’s so cool! Very suiting indeed! @♥beauxs mom said: Thanks so much for your kind words, I’m happy to hear you succeeded, it looks so neat! And I really LOVE the colors you chose for the design, great job! Love this! I've got to try it out! So nifty!! I'm totally going to have to try this out. Thank you for the awesomely clear tutorial! I've been looking at your tutorials, and I'm in love with that silver nail polish. What brand is it? @Jane: Thanks!!! I must buy it now! Thanks so much for the tutorial! Your result is just flawless! @Andrea - Millenium is so Hard to Find! Let me know if you find one - I've been looking for it since forever! Can you tell me please what's the brand of the pink polish? Dank u well !! I love your tape manis! You are so creative!More power to your blog! I'm going to attempt this one for a nail art contest--I'll make sure to let you know how it comes out! But it is so much fun!! Thanks--you rock!! Love it!!! I tried it on my own with Essie Chinchilly and Sew Psyched. You come up with such great ideas! Oh my, that is amazing! When I apply the tape to the nail the shape comes never out like yours. It looks like a very crooked explosion. Yours is so straight, my explosion comes out crooked. It's not easy to place the tape stripes right. How long did you practised? I just tried this again! I love it. Thanks for the tutorial! I've been reading your blog for quite a while but never took the time to write a few words : shame on me !! Thanks so much for all your tutorials, your inspiration you share. You're so gifted, its amazing ! A French "Nailista" completely mad about your art, because it is art. Just so you know, this tutorial has been posted on Buzzfeed without credit to you. The article is at http://www.buzzfeed.com/peggy/12-amazing-diy-nail-art-designs-using-scotch-tape. Your tutorials are amazing, and I hate to see someone not getting their fair due. I don't think (s)he gave credit...unless this is your account...? wow that looks amazing i will try it sometime!! cant wait! Thank you for this great tuturial. I didnt ever really like to paint my nails, but then I got them long, and now I find painted nails quite exciting. I found your blog, and already love your designs. I tried this one for christmas nails, and was surprised of how easy it was. Just FYI @cute_tutorial on Instagram is using your photos with out crediting you! I featured this design in a recent Ironman manicure (for the release of Ironman 3 this weekend!) because this is one of my favorites of your designs and it just makes me think of superheroes. I was actually inspired by the guest post manicure you did with Orly Sweet Peacock, so both your blog and hers got a backlink in my post! Thanks for all the inspiration! I have been reading through all your archives and will be sad when I reach the end. I left you a message on your blogpost. ;-) The glow in de dark accents totally completes the mani, so so cool. ^_^ Thanks for leaving a comment! Your tutorial made the design really looks so easy. I love the combination of colors you use for these nail designs. Nice tutorial, i will do this at home. I was clueless as to how the different nail designs are done. Thanks again for sharing! I hope you will soon post more. Unfortunately I´ve read all your articles and now I´m sad about getting to the end. I didnt knew that adhesive tape can also be used like this... I really liked it.